Lyft is now offering new drivers an earnings guarantee of up to $4400, or a Lyft sign up bonus of $100! How Does The Lyft Sign Up Bonus Work? To get your Lyft driver bonus guarantee, simply apply using one of the Lyft driver referral codes below. You must use a Lyft invite code when you sign up to get your Lyft driver sign on bonus. Here are our top Lyft driver invite codes for 2019. Simply click a code to get on the road with Lyft. Unfortunately, Lyft has stopped offering large $500, $1000, or $2500 cash sign up bonuses for new drivers. Any sites that tell you otherwise are outdated or dishonest. However, with Lyft demand at its highest level ever, and Lyft drivers now giving well over a million rides per day, there has never been a better time to sign up to be a Lyft driver. Getting your Lyft driver bonus is easy. Simply click one of the sign up buttons below to start your Lyft application with a Lyft driver referral code. The button below will get you a sign up bonus or an earnings guarantee of up to $4400. The standard Lyft bonus usually pay an extra $1 to $2 per ride. However, In most cities, Lyft no longer offers a sign up bonus that pays extra cash to a new Lyft driver. While Lyft is phasing out cash sign up bonuses for new drivers, Lyft will still guarantee your earnings during your first 30 to 90 days of driving. Beware of unscrupulous sites claiming to offer a Lyft cash bonus that pays an extra $1000, $2500, $5000 to the driver. Although many sites still have these offers up, those large cash Lyft bonuses no longer exist. Applying for Lyft using the button below (TAKINGLYFT) will get you an earnings guarantee bonus of up to $4400. Lyft signup guarantees have been highest in cities like Los Angeles, San Francisco, Boston, and Chicago. See recent Lyft driver bonuses or guarantees in your city. Read on to learn about the different types of Lyft new driver bonuses and the difference between a Lyft sign up bonus and a Lyft sign up guarantee. If you plan on driving Lyft part-time, your best bet is to sign up with a code that can get you an extra $2 per ride on your first fifty rides. Use the code RSCLYFT when signing up to get your $100 sign up bonus. If you plan on driving full time for Lyft, you can use any of the codes on this page. Here’s how the other Lyft bonuses work. This Lyft promotion gives you an earnings guarantee. Which one you get is determined by Lyft when you sign up. So, if you sign up and get a $3000 earnings guarantee for completing 300 rides in 60 days, you’ll be guaranteed to earn $3000 for those rides. If you don’t earn $3000, Lyft will pay you the difference. Use the code TAKINGLYFT to guarantee your earnings in your first month or two of driving for Lyft. Click the button below to begin your application with the standard Lyft sign on bonus earnings guarantee. In most markets, Lyft has switched to a new driver sign up earnings guarantee that’s as high as $4400. However, this Lyft offer is different from a cash sign up bonus. Basically, if you complete a certain number of rides within your first few weeks, Lyft guarantees you will earn a certain amount (gross earnings). If you don’t, Lyft will pay you the difference. Beware of claims that the $2000 or $4400 Lyft guarantee is a cash bonus. It’s not. Below is a screenshot of the actual terms of a prior Lyft guarantee for $3500. So, if you received the Lyft guarantee from the above image, you were guaranteed to earn at least $3500 if you completed 320 rides in your first 28 days. That’s 80 rides, or about 40 hours of driving, per week. The actual ride requirement and guarantee amounts are determined by Lyft based on driving city. Also, you must complete all the rides to satisfy the requirements. To sign up for this guarantee, click the “Lyft Guarantee” button below. If you’re looking for free Lyft rides, check out our Lyft rider promo code page. If I Don’t Have A Car, Can I Still Sign Up For Lyft? Yes you can. If you don’t have a car, you can still drive for Lyft with Lyft Express Drive, which partners with Hertz, Avis, and Flexdrive to rent cars to drivers who don’t have one. After clicking one of the sign up buttons on this page, choose the Lyft Express Drive option when you’re asked to add a vehicle. Check out our Lyft rental car page for more info. If you want to manually enter a code when you sign up, instead of using one of the links above, simply enter the code TAKINGLYFT, or RSCLYFT in the promo code box when signing up for Lyft. It depends on a lot of factors, like where you’ll be driving and your experience level. Experienced drivers on Lyft can make up to $25 per hour or more in the largest markets. Nationally, Lyft drivers average around $17.50 per hour, $2 more per hour than Uber drivers (before expenses). But, if you have a vehicle that qualifies for Lyft XL or Lyft Lux, you can earn more than that. Lyft driver earnings vary a lot by market, and drivers in large cities tend to earn more than drivers in smaller cities and towns. Click the button below that to see what some drivers have earned recently. Or, keep reading to see how large the Lyft driver sign up bonus has been in your city. Last year, Pittsburgh was offering a sign up bonus of up to $800, and San Francisco was offering a $750 bonus. San Jose, Indianapolis, Tacoma and Seattle all had a $650 Lyft bonus at one point. And San Diego, San Antonio, Sacramento, New Orleans and Minneapolis were at $600. For the most part, the $600 to $1000 cash bonuses have gone away for now. While there are still a few cities with bonuses in that range, most cities, like Charlotte and Washington, D.C., have an earnings guarantee now. Using a Lyft driver promo in Tucson, Rochester, Jacksonville, Chicago, Boston, and Charlotte could get you an extra $200 – $400. And the New York City bonus was $400 earlier in the year. Currently, Los Angeles has a sign up bonus of $360. The Los Angeles Lyft bonus was at $850, but dropped a few months ago and then Lyft switched it to a $2000 guarantee. Even so, Los Angeles is one of the higher earning Lyft markets. Some of the these amounts are also available in other Lyft markets. To see what a recent Lyft bonus or guarantee has been in your city, simply scroll down. In some markets, Lyft offers more than one sign up bonus or guarantee amount. You will begin receiving your bonus as soon as you start completing rides. The Lyft driver bonus generally pays between $2 and $5 extra per ride. So, if your bonus amount is $1400 in Los Angeles for 400 rides, you would receive an extra $3.50 per ride for your first 400 rides (400 x $3.50 = $1400). This is in addition to your regular earnings for those rides. Keep in mind, Lyft driver promo amounts change frequently. The top bonus in Los Angeles was $1400 until early February 2018. Now, it’s dropped to $360. Usually, you have between 30 and 90 days to complete the rides. We update the list frequently. If you find an updated Lyft promo code amount, email us at info (at) ridesharecentral.com, and we’ll add it to the list. When you apply to drive for Lyft, you’ll need to upload the following items during the Lyft application process. If you have those items handy, you can click the button below to start your application. First, you’ll need to verify your phone number. After clicking “Become A Driver”, Lyft will send you a text with a verification code. Enter it on the site. If you use our link, a referral code should already be filled in. If it’s not, simply type in RSCLYFT or TAKINGLYFT. You must use use a Lyft referral code from the beginning to get your Lyft sign up bonus. Lyft will then ask if you plan to use your own vehicle, or rent one using Express Drive. For more information check out our Lyft car rental page. Here is where you enter your name, address, driver’s license info, and consent to a background check. The last step is to upload your license and insurance documents. Once you’ve filled out your application and uploaded your documents, Lyft will run a DMV and criminal background check. This is the part that sometimes takes a few days. After approval, you will need to pass a vehicle inspection to get on the road. You can complete the inspection at most Pep Boys locations. After you successfully complete your vehicle inspection, you can get out on the road and give someone a Lyft! Basically, if you sign up to drive for Lyft using a Lyft referral code, you will get your bonus. If you don’t use a code when you first sign up, you won’t get a bonus. Lyft used to have two types of driver sign up bonuses – the lump sum bonus and the per ride bonus. In 2017 though, the company mostly phased out the lump sum bonus. The Lyft bonus for drivers, whether it’s for $500 or $50, is now paid out per ride instead. The old Lyft bonus required a driver to complete certain number of rides in a set amount of time. If the driver succeeded, he or she would get their entire bonus at once, after completing all the rides. For example, the bonus in Chicago may have given a driver a lump sum of $750 for completing 150 rides in 45 days. Or, they may have offered new drivers in Atlanta $350 for completing 75 rides in 30 days. The time given to complete the required number of rides ranged from 30 to 100 days. This type of lump sum Lyft new driver bonus is pretty much nonexistent at this point. Use the Lyft code TAKINGLYFT to get a bonus or guarantee of up to $4400! Instead, Lyft now offers new drivers a per ride bonus. This is pretty much the standard Lyft driver promo these days. Basically, a new driver can still get a $400, $500, or $750 bonus. However, instead of getting the $400 all at once, after completing 100 rides, the driver now gets an extra $4 on each of the first 100 rides. Say you sign up to drive for Lyft in San Diego with a $600 bonus. The bonus might be paid out at $3 extra per ride on the first 200 rides. On a Lyft bonus of this size, the new driver would probably have 45 to 60 days to complete the rides. So, for each ride the driver gave during that time, they’d receive a $2 bonus from Lyft, on top of their regular pay from the ride. Or, say the Lyft driver referral bonus for Boston is $350, instead of the $500 or so it really is. This Lyft bonus might pay out an extra $5 per ride on the first 75 rides. The new driver would probably have 30 days to complete this promo. The numbers and ride requirements listed in the above Lyft driver promos are just hypothetical examples. So, even if you sign up to drive for Lyft in Boston or San Diego, the above numbers may not be your driver bonus. Even within a city, the Lyft bonus amount can differ. Once, I saw a Washington D.C. Lyft driver referral code for $800, and another for $200, in the same week! One offered a Lyft bonus of $800 for 200 rides, while the other bonus offered $200 for 50 rides. Overall, the per ride type of bonus is far more common than the lump sum bonus. Also, many drivers actually prefer this type of sign up bonus compared to the lump sum bonus. The reason is that this bonus is paid out as the new driver completes rides, which means you start getting your bonus as soon as you start driving! One of the complaints about the old Lyft system was that the ride requirements to get the sign up bonus were too high for part time drivers. This bonus addresses that issue so that every new driver will get a Lyft driver bonus, provided they use a Lyft code when signing up to drive. You can only use one referral code when signing up to drive for Lyft. No stacking of codes to increase your bonus is allowed. After you are approved, you will begin receiving your bonus as soon as you start completing rides. The Lyft bonus terms are subject to change and not guaranteed. As a Lyft driver, you are subject to Lyft’s Terms of Service. Lyft can deny an application for any reason. Is There A Difference Between A Lyft Sign On Bonus Code, A Lyft Driver Promo Code, And A Lyft Referral Code? Nope, they’re the same thing. You may hear different terms for the code you use to get a Lyft bonus. They all mean the same thing, and they all work the same. Whatever it’s called, it’s the Lyft code you use to get a bonus when you sign up. Should I Sign Up To Drive For Lyft If I Already Drive For Uber? Absolutely. For one thing, most drivers prefer to drive for Lyft. Lyft support tends to be friendlier and slightly more responsive. Also, after you sign up to drive for Lyft, and complete your Lyft sign up ride requirements, you’ll still be eligible for other Lyft bonuses. Besides that, it’s always good to have a backup source of revenue in case you get deactivated from the Uber system, even temporarily. This happened to a driver I knew. A passenger claimed she was driving under the influence (she doesn’t drink). When something like this happens, both Uber and Lyft will temporarily deactivate the driver for 48 hours while they investigate. She was reactivated 48 hours later, but that deactivation cost her a quest bonus that week. She’s now signed up for both Uber and Lyft. Another reason to sign up for both is that every now and then, the Uber or Lyft systems may go out for a little bit. It doesn’t happen often, but when Uber goes down, demand tends to go way up on Lyft. Likewise, in the rare occasion of an Lyft system crash, demand on Uber skyrockets. Finally, it’s important to keep in mind that within a city, certain areas are busier on Lyft, and certain areas are busier on Uber. How Large Will My Lyft Bonus Be? When you sign up to drive for Lyft, the size of your bonus varies based on the region you’ll be driving in. The amount of your bonus is generally not dependent on which Lyft driver code you use. If you use the Lyft driver referral code BESTCODE2019, you’ll receive the same bonus that you would get if you used the code MOVER. The city you’re driving in is generally what determines the size of your bonus, not the individual Lyft code. However, there are some 2019 exceptions. If you use the code TWENTYRIDES, you could get an extra $5 per Lyft ride for your first few rides. And if you use the code TAKINGLYFT, you may get a Lyft earnings guarantee if one is being offered in your city. Lyft Bonus amounts and ride requirements may vary based on the referring driver and the region of the referred applicant. Referring drivers can view the bonus requirements for applicants they refer in their market through the driver portal or app. These requirements may be different if the referred applicant is in a different market than the referring driver. What Happens After I Submit My Lyft Driver Application? As noted above, once you’ve begun your application, Lyft sends your confirmation email (sometimes it takes a few hours) with the amount of the Lyft driver promo bonus available in your city. If they don’t, you can simply email Lyft support and ask them what your sign up bonus amount is. Lyft also usually tells you your signup bonus amount after you click “Become a Driver.” From that point, approval usually takes between 2 and 7 days, but can take up to 3 or 4 weeks. The sign up bonus amounts change often, so it’s difficult to post a totally up to date chart for every city. However, the bonus amounts tend to be higher in newer markets and some of the larger markets around the country. Currently, a number of Lyft markets in New York, New Jersey, California, Pennsylvania and Colorado have higher Lyft driver promo bonuses. The amount of the Lyft sign up bonus depends on the demand for Lyft drivers in that city. The national average for Lyft drivers is about $17 per hour. However, there is a lot of variation from driver to driver and city to city. Experienced, full-time drivers can make around $23-$30 per hour in the larger markets. Drivers can earn even more if they complete various Lyft driver streak and weekly bonuses. Part-time experienced drivers in larger markets can make $22-$28 per hour if they only drive during busy hours. On Lyft Lux (higher end vehicles), or Lyft XL (larger vehicles), they can make even more. If you’re just starting out though, a more realistic expectation is around $15-$20 per hour. Here’s what a few drivers who drive for Lyft have been able to take home recently in one day or one week driving for Lyft. Keep in mind, some of these Lyft drivers pulled long hours to reach these numbers, but they did it. Note: As of Fall 2018, Lyft has replaced the Power Driver Bonus with a combination of ride challenge and streak bonuses. An example of a Lyft ride challenge is: Complete 100 rides between Monday 5 AM and Friday 6 AM to earn an extra $250. An example of a Lyft streak bonus is: Complete 4 consecutive rides between the hours of 7 AM and 9 AM to earn a $10 streak bonus. Lyft Power Driver Bonuses can top $50 to $500 per week in addition to your regular earnings. In some markets, Lyft also offers weekly guarantees for new drivers. These guarantees usually requires a set number of rides and a 90% acceptance rate. Lyft earnings vary by city, but in most markets the average is in the $15-$20 per hour range. However, experienced drivers who know their way around tend to earn more, as do drivers who only drive peak hours. Those drivers can earn $20-$30 per hour if they’re driving full time, and even more if they only drive during certain hours. Lyft drivers who are part time have been known to average over $30 per hour if they drive only during really busy times. Lyft Ride Challenges and Streak Bonuses can add hundreds to your Lyft driver pay. However, in most markets, the $15-$18 range is more realistic when you’re just starting out. That being said, earnings can be higher in large cities like Chicago, Philadelphia, Los Angeles, Boston, Orange County, Dallas, Atlanta, and San Francisco. Earnings are often also higher in newer Lyft markets because there are fewer drivers. So, if Lyft recently arrived in your neck of the woods, now is the time to sign up and drive for Lyft! If you need another incentive, once you’re approved to drive for Lyft, you can refer other drivers and get referral bonuses once they start driving. Make sure you meet these requirements in order to get your bonus. You must be at least 21 years old* with an active U.S. driver’s license for at least 1 year to apply to be a Lyft driver. However, you can create a passenger account at 18. You must be licensed to drive for at least a year prior to applying. There are some cases where you may see an error message on your application regarding your driving history — if your license was recently reissued, or your state does not provide the issue date. Get the details on how to handle these issues. Every potential driver is required to undergo both a driving record check and a criminal background check. Lyft reviews the results of the checks and disqualifies individuals who fail to meet the standards set by both Lyft and local regulations. You do not need to own a vehicle to drive with for Lyft. However, if you do, these are the requirements. The vehicle must be in good working order. Lyft requires an annual vehicle inspection. The vehicle must be model year 2004 or newer for Lyft. However, in some cities, the requirements are more strict. For Lyft Lux (formerly Premier), the requirements are also more strict, and vary by city. For more information, visit our Lyft vehicle requirements page. Do I need to own a car to drive for Lyft? No. You can sign up to drive for Lyft, and simply select the rental option when filling out your Lyft application. This will set you up to rent through Lyft Express Drive, which partners with Avis, Hertz, and Flexdrive to provide vehicles to drivers on the Lyft platform. You can also rent a car through Maven or Hyrecar. Can I deliver food or other items with Lyft? Unfortunately, no. Lyft does not have a food delivery component at this time. However, if you don’t want to drive passengers around, you can apply to be a Doordash driver. Becoming a Doordash dasher is actually easier as the vehicle requirements are less strict. In most places, you can deliver using a car, motorcycle, bicycle, and sometimes, even on foot. The same is true for other delivery services like Postmates and Caviar. You learn your way around very well, you meet new people, and you make money doing it. Most of the time, it’s very enjoyable. For me, Lyft was a great way to expand the circle of people I interact with. I’ve literally met thousands of people driving for Lyft from all walks of life, and I’ve made thousands of dollars in the process. On top of all that, Lyft is also a great way to network. I usually end each week with a couple of business cards, and also hand my own out. Drivers are paid weekly via direct deposit. Drivers can also cash out instantly during the week (multiple times) as long as they’ve earned $5 or more. If you use your code to refer new Lyft passengers, you receive your Lyft bonus when the new Lyft rider uses your code to start a Lyft account, and takes their first ride. If you use your code to refer new Lyft drivers, you start receiving your bonus the moment the new Lyft driver gives a ride. What are the other driver bonuses Lyft offers? Lyft phased out the Power Driver Bonus in late 2018. The following information is preserved for archival purposes only. Besides the Lyft sign on bonus, Lyft also offers the Power Driver Bonus. If I driver completes a certain number of rides (with some during peak hours) and keeps a 90% acceptance rate, they receive a bonus. The bonus is either a cash bonus on top of weekly earnings (usually $100-$250), or Lyft takes a smaller commission. There are two levels to the Power Driver Bonus. If you give enough rides to qualify for the first level, instead of taking 25% of the fares for that week, Lyft will only take 15%. If you qualify for the second level bonus, Lyft only takes 5%. You can also use your Lyft code to refer new Lyft drivers and riders. Lyft even lets you create your own catchy code that you can put on business cards. You can also post your code on your social media accounts. That way, your friends and followers can use your Lyft driver referral code to get a Lyft driver bonus or get discounted Lyft rides. Refer friends and family to Lyft to increase your earnings. When is the best time to drive for Lyft? Overall, weekends are the most lucrative time to drive for Lyft. Not just weekend nights, the whole weekend. Also, traffic is lighter overall on weekends, so you get better mileage. Besides that, the morning and evening rush hours are where the most money is. Check out our Lyft city driving guides for more information on the best time to drive Lyft in your city. When I drive for Lyft, do I have to give a minimum number of rides to stay active? You used to have to give one ride every thirty days to stay active, but that is no longer the case. You can sign up to drive for Lyft, and once you’re approved, your account should stay active. Is one sign up bonus code or Lyft driver referral code better than another? Not really. The bonus amount tends to be based on the city you want to drive in more than the specific Lyft driver promo code. There is some exceptions. There is a type of code that offers $100 for completing one ride. Usually, I wouldn’t recommend using this kind of code, because in most markets, the driver bonus amount exceeds $100. However, if the Lyft driver bonus in your market is lower than $100, you may want to use a $100 for one ride code. However, that type of promo code is rare. Another type of code is our ZOA code, which offers up to an extra $5 (where available) per Lyft ride. Other than those exceptions, one driver referral code is as good as another. What are Lyft driver hourly guarantees? Ride requirements for the guarantee hours change based on region and time of day. If you meet the requirements below, check your eligibility in the Driver Dashboard. First, you’ll need to opt in when you get a new text or notification about guarantee hours. Each week, we have an opt-in limit, and we change which cities to offer guarantee hours to, so not everyone will be able to opt in. Eligible drivers can opt in directly through the Driver Dashboard. Drivers can opt in at any time directly before a guaranteed hour begins, but they’ll only qualify for the hours that haven’t occurred. You must spend 50 minutes of each hour in driver mode, and fulfill the requirement for completed rides. Each ride counts toward the hour it was requested in (not when it was completed). We count your time in driver mode from the beginning of each hour (for example, 10 am to 10:59 am or 12 pm to 12:59 pm). How do Lyft new driver weekly guarantees work? New Lyft drivers (approved within 30 days of applying) in select cities can earn a guaranteed amount per week. If you don’t hit the weekly guarantee amount on your own, we’ll cover the difference. If I sign up to drive for Lyft in one city, can I drive in another city? Lyft drivers can usually drive in other cities in their state. However, because Lyft requires insurance documents to be from the state you’re in, you can usually not cross state lines to drive in another city. There are some exceptions, like the tri-state area of New York, Pennsylvania, and Connecticut, and the Washington, D.C., Maryland, and Virginia market. Can Lyft drivers see what a passenger tips? Yes, drivers can see the amount a passenger tips in their driving history and the individual Lyft trip record. What are you waiting for? Get your Lyft driver sign up Bonus! Click the “Join Lyft” button below to sign up to drive for Lyft. 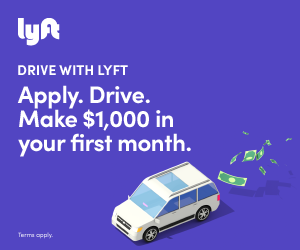 Whether you’re looking to make an extra $200-$300 a week before or after work or school, or $1,000 a week or more driving full time, if you drive for Lyft, you can accomplish either. Beyond that, the job is what you make it. While you’re basically driving people around and getting paid, you meet a lot of interesting people driving for Lyft, and you can even network while you drive. I met one driver who marketed his interior design business to riders and picked up a number of clients. Another driver marketed his hand crafted jewelry business while driving and more than doubled his income. With a little creativity, the possibilities are endless. On top of that, you get paid. How much depends on the hustle. But first you have to apply. So sign up for Lyft today, using a Lyft driver referral code, and get your Lyft sign up bonus!